Grey and Marcia interview Portia Halbert about her work with CA State Parks at Natural Bridges State Park. Meet Portia Halbert, she is an Environmental Scientist with the Santa Cruz District of California State Parks. 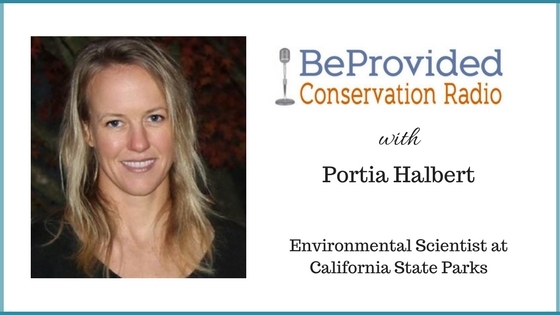 In our next BeProvided Conservation Radio Podcast, Portia tells us what it is like to manage 70,000 acres of parkland in the Santa Cruz District. Her and her team are responsible for managing and restoring native habitats. She also tells us what it is like to be a member of the statewide burn crew that helps reintroduce fire to the landscape. She also helps protect sensitive species such as the California red-legged frog, San Francisco garter snake and the Marbled Murrelet pictured above. Ms. Halbert is also the Vice President of the Santa Cruz Mountains Bioregional Council.